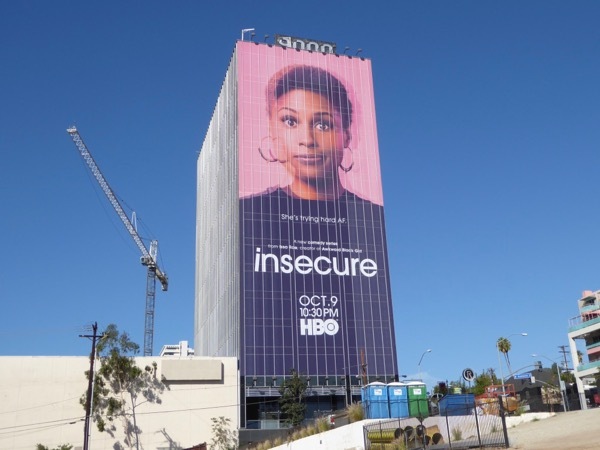 In the HBO comedy Insecure, Golden Globe nominee Issa Rae plays 'Issa Dee', a modern day African-American woman struggling to navigate professional and personal life in Los Angeles with her best friend 'Molly' (Yvonne Orji). 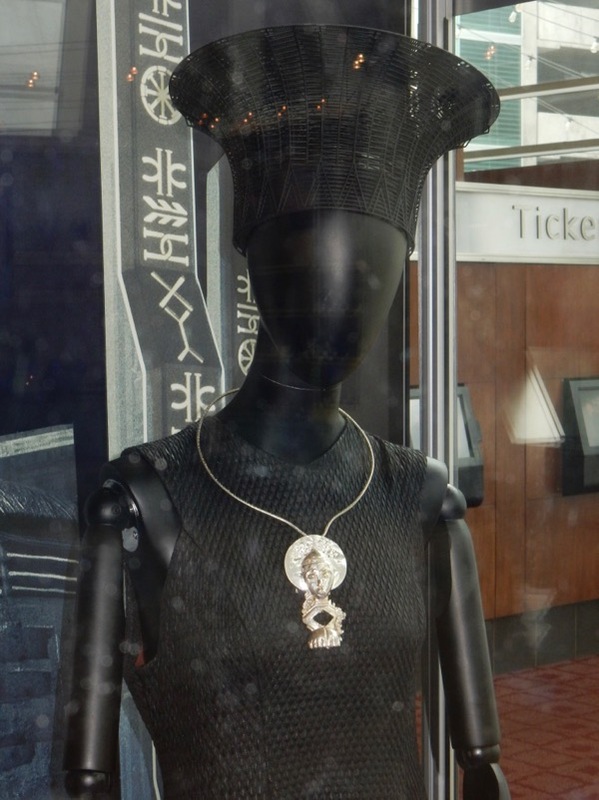 Ayanna James was Costume Designer on the sophomore season of Insecure with help from Assistant Costume Designer Derica Cole Washington and Costume Supervisor Devon Patterson. 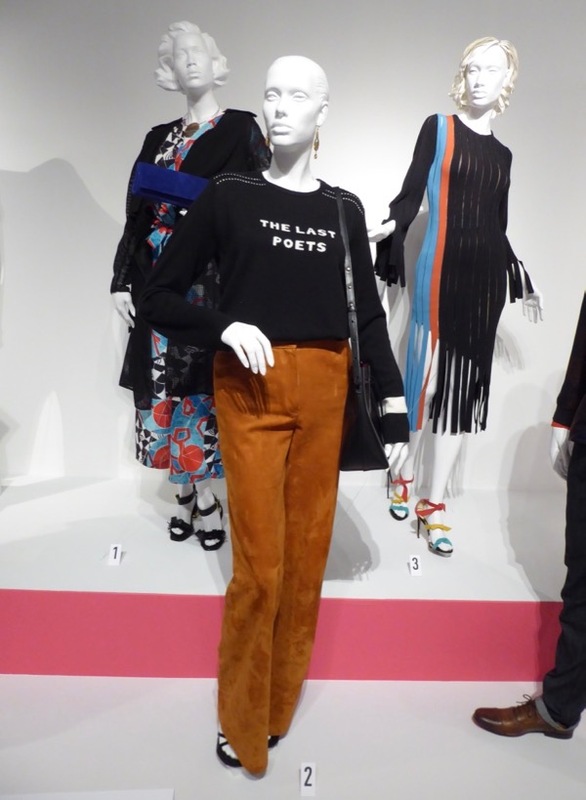 I believe these costumes were from the second season episode 'Hella Questions' when Issa attends the African American exhibit at CAAM (California African American Museum) wearing 'The Last Poets' t-shirt, who were a spoken word jazz group. 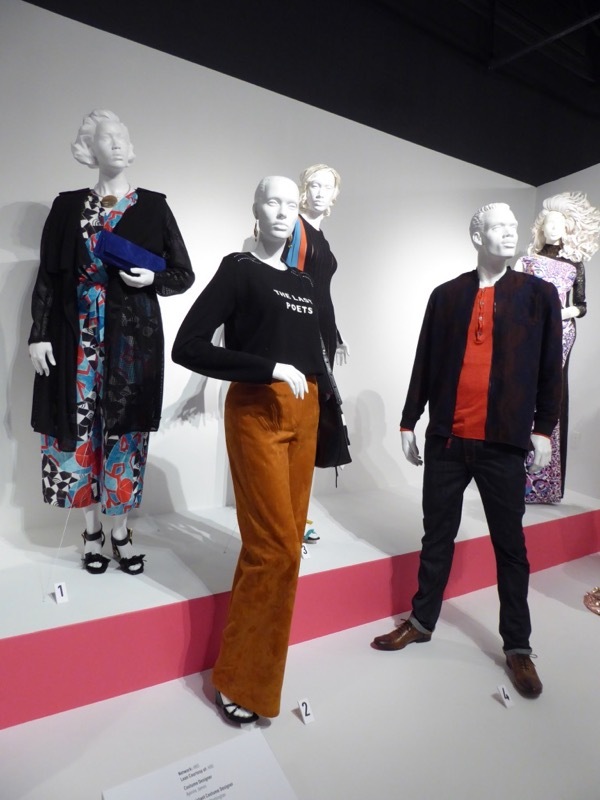 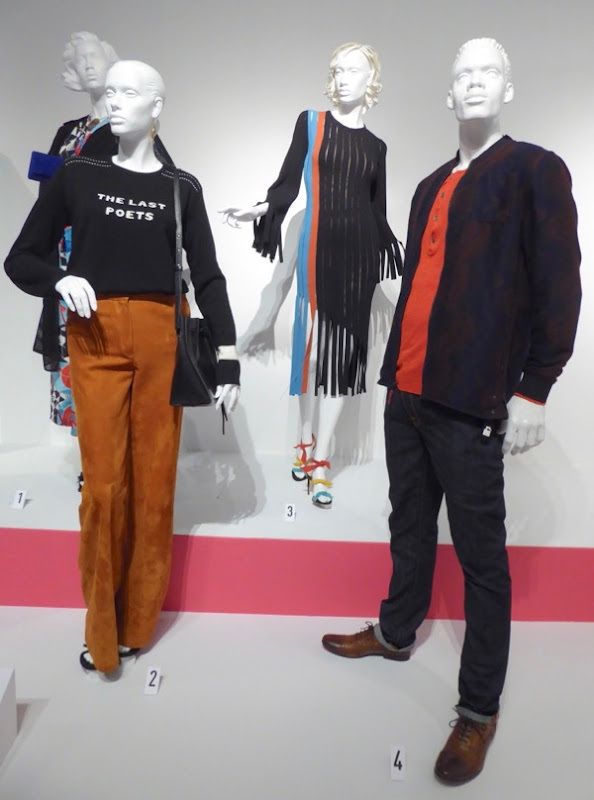 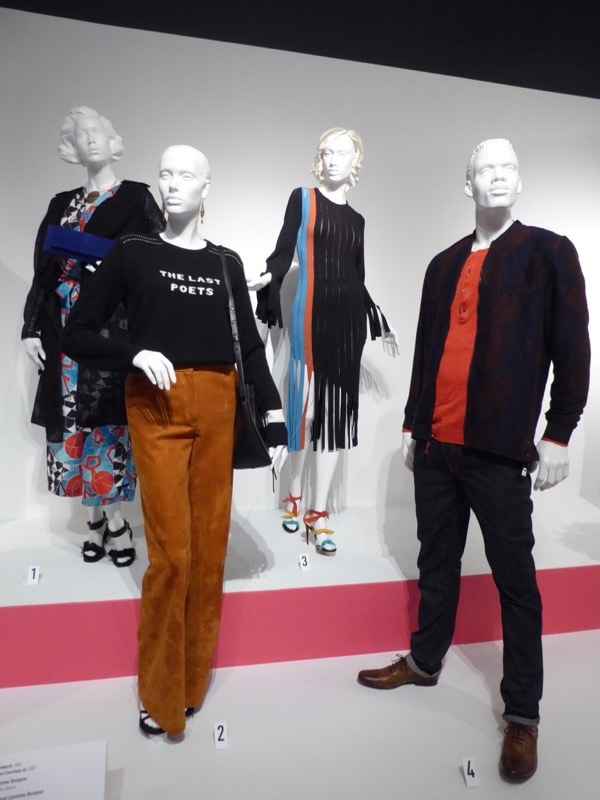 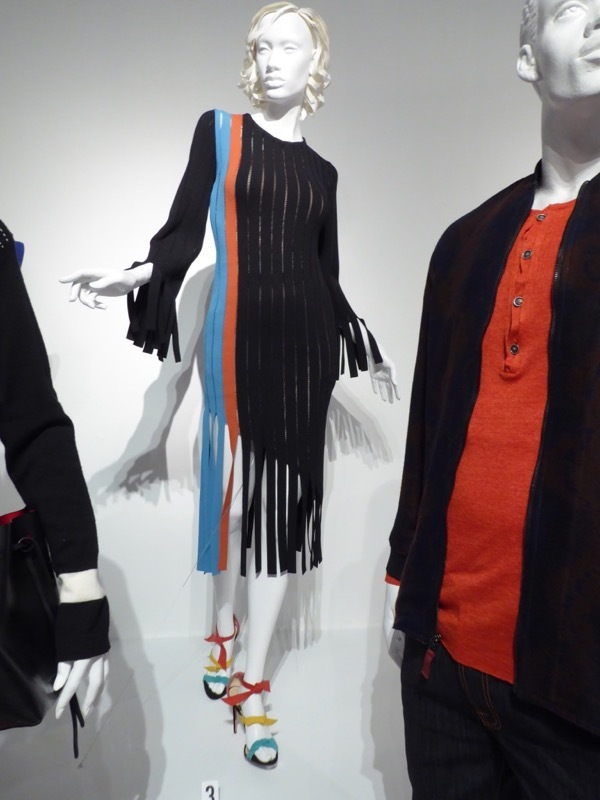 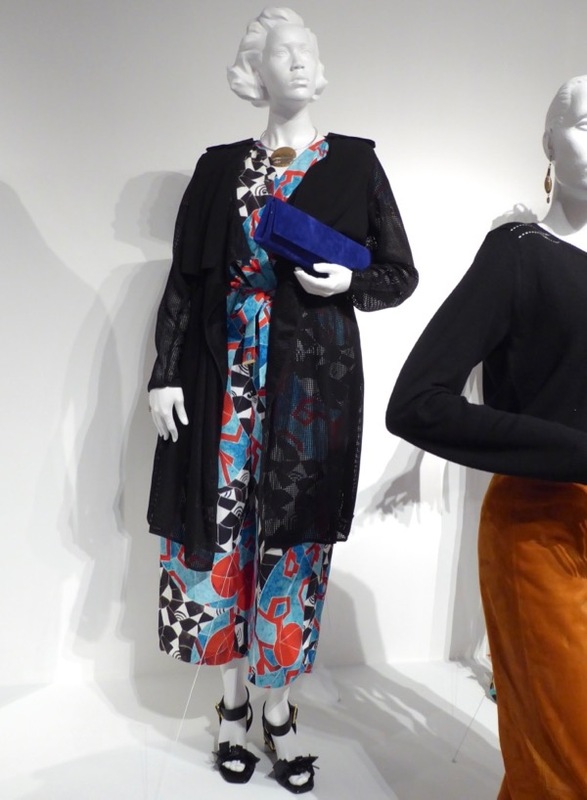 These season two costumes, featuring outfits worn by Issa Rae, Natasha Rothwell, Yvonne Orji and Jay Ellis, were photographed on display at the FIDM Museum in Downtown L.A. on August 23, 2017. 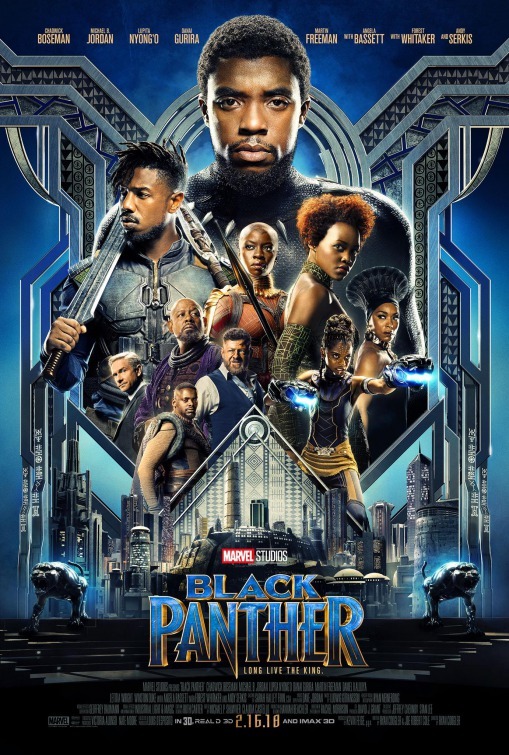 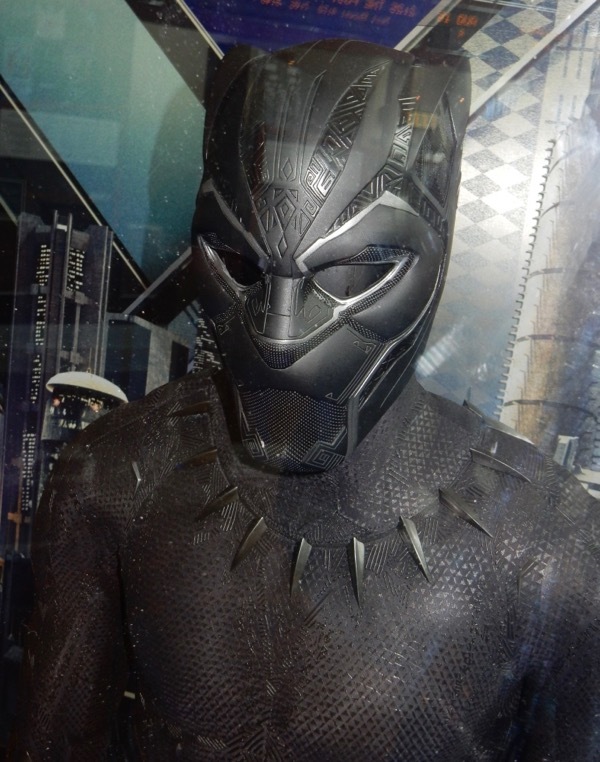 After the events of Captain America: Civil War and the death of his father, Chadwick Boseman's 'T'Challa' heads back to Wakanda to claim his throne, but internal tribal challenges and external factions threatens to spill out of the isolated African nation and endanger the world in the first Black Panther solo movie. 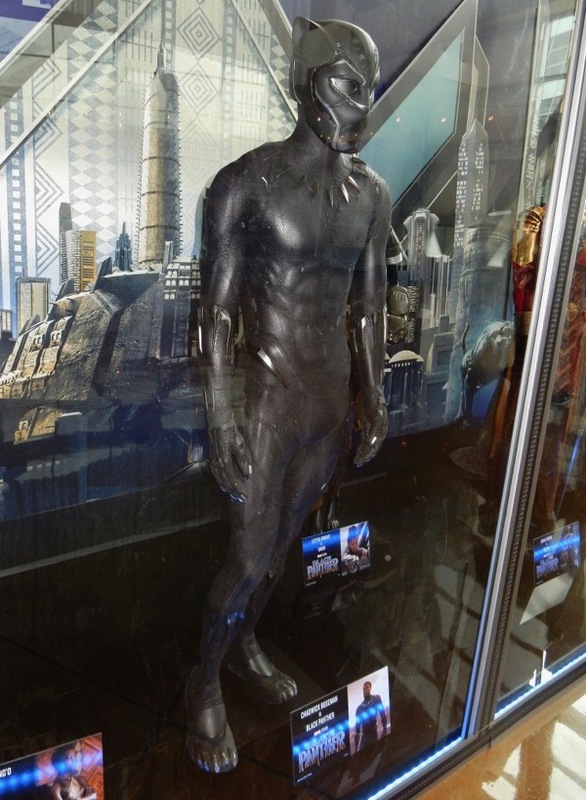 The Black Panther gets a new updated look, with a more feline-like mask, in Ryan Coogler's movie and this sleek catsuit was photographed alongside other cool outfits from the film at ArcLight Hollywood cinema on January 19, 2018. 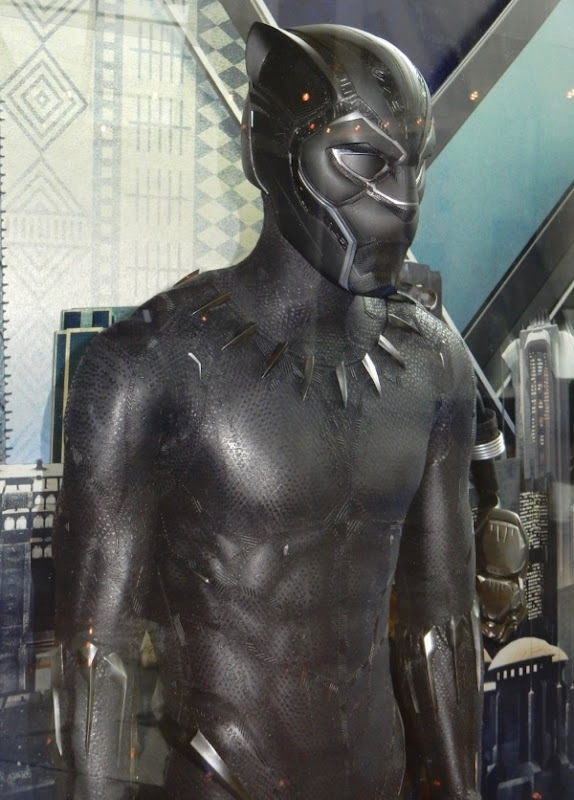 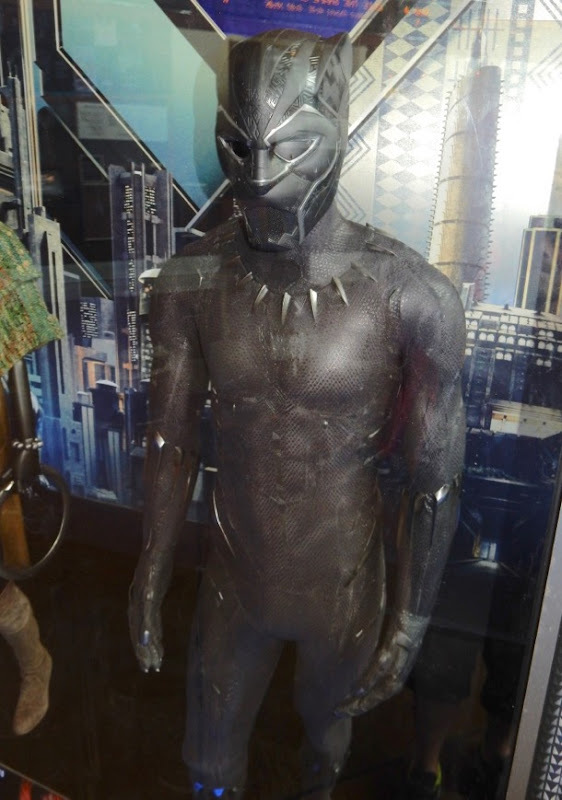 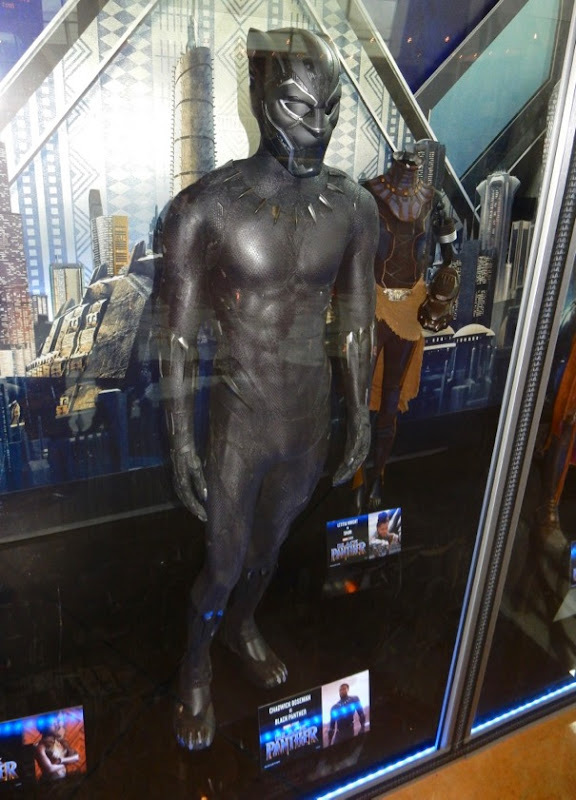 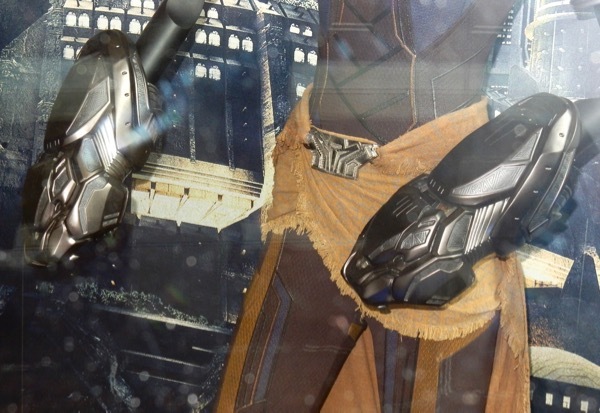 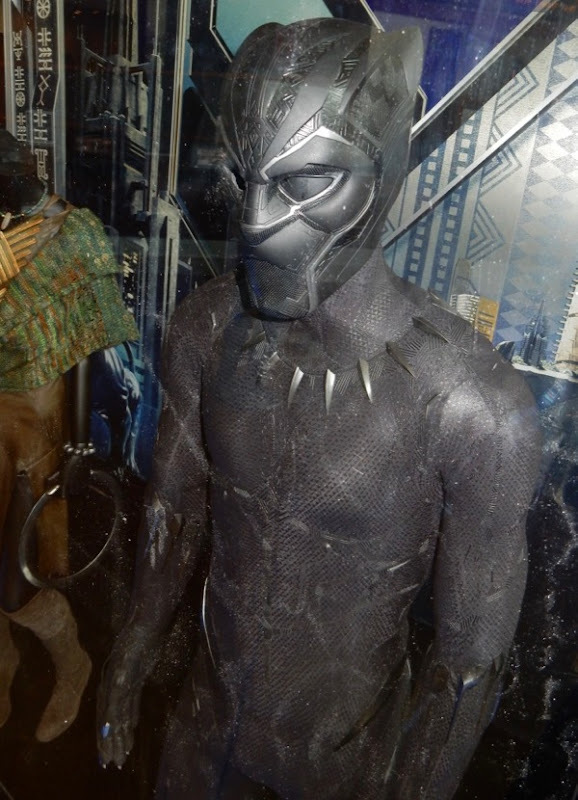 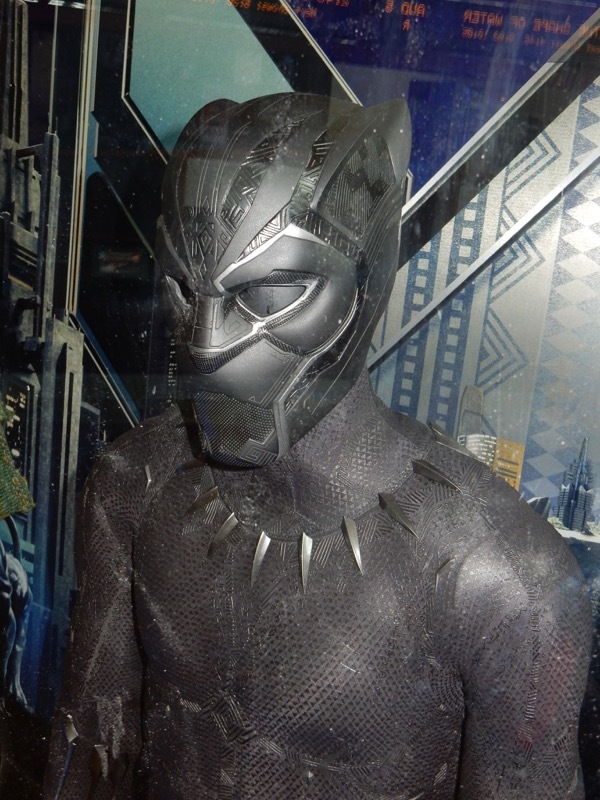 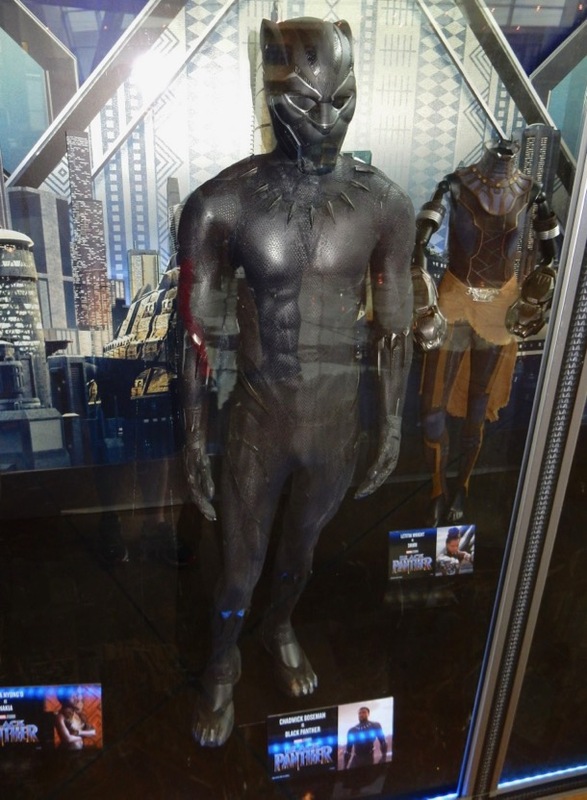 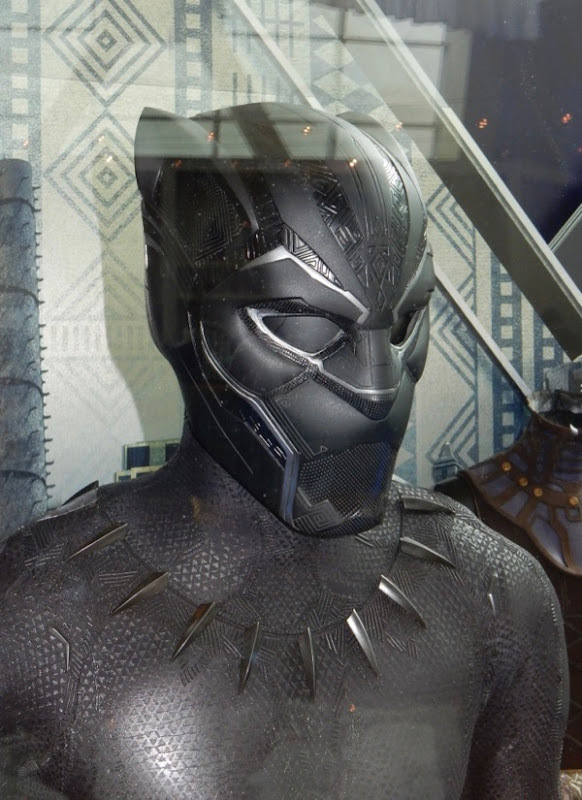 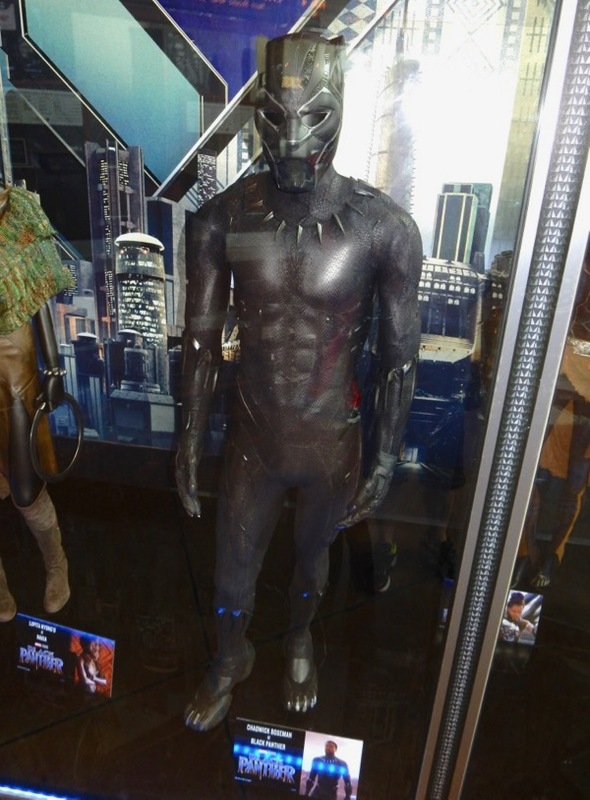 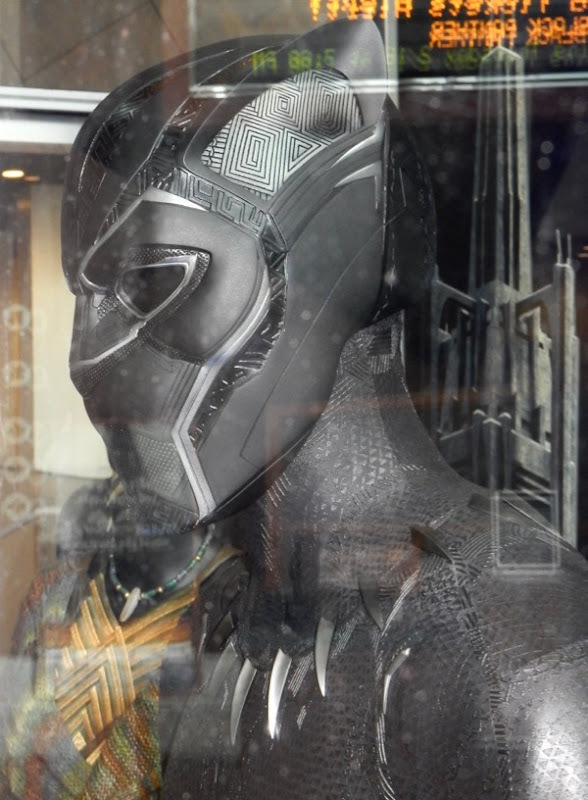 You can also check out the Black Panther costume from Captain America: Civil War on display. 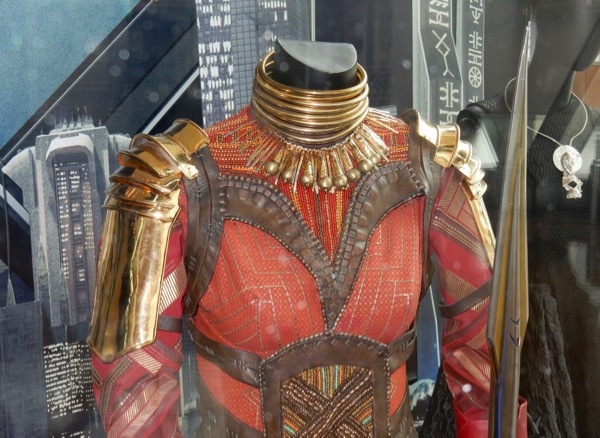 Ruth E. Carter was Costume Designer on the new Marvel Studios film starring the comic book company's first black superhero and responsible for dressing the inhabitants and heroes of the high-tech world of Wakanda. 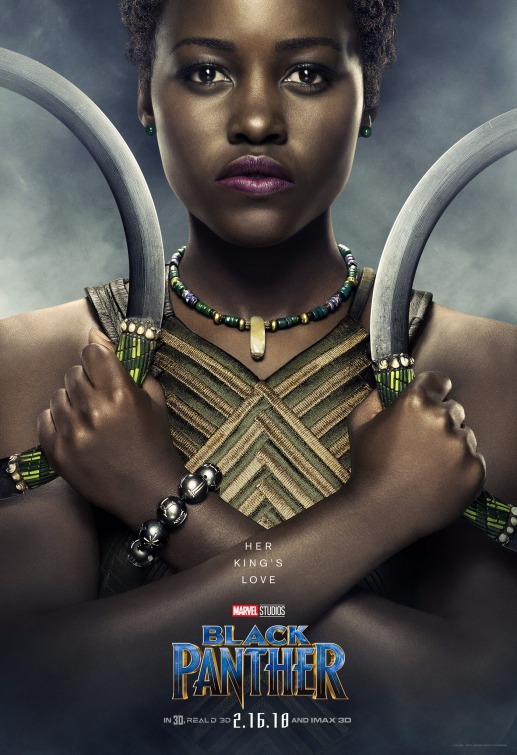 Lupita Nyong'o plays Nakia, a former lover of T'Challa and an undercover agent of Wakanda's elite female fighting force, the Dora Milaje. 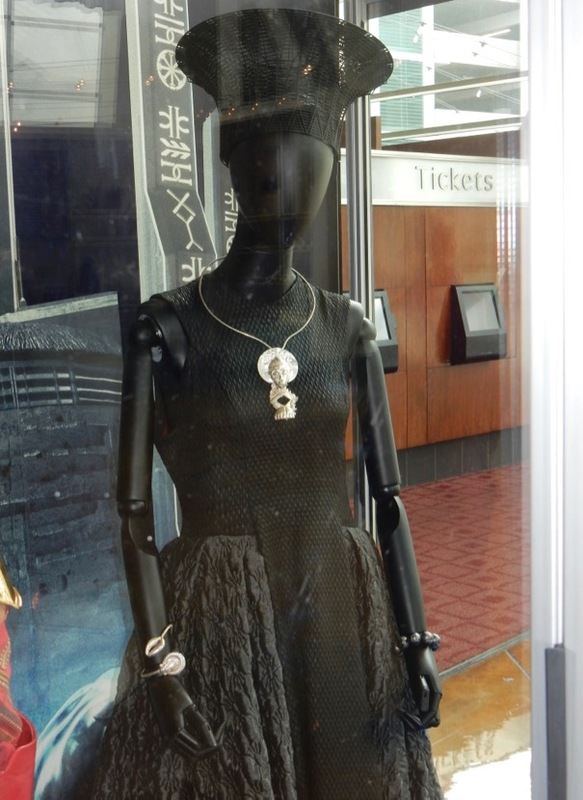 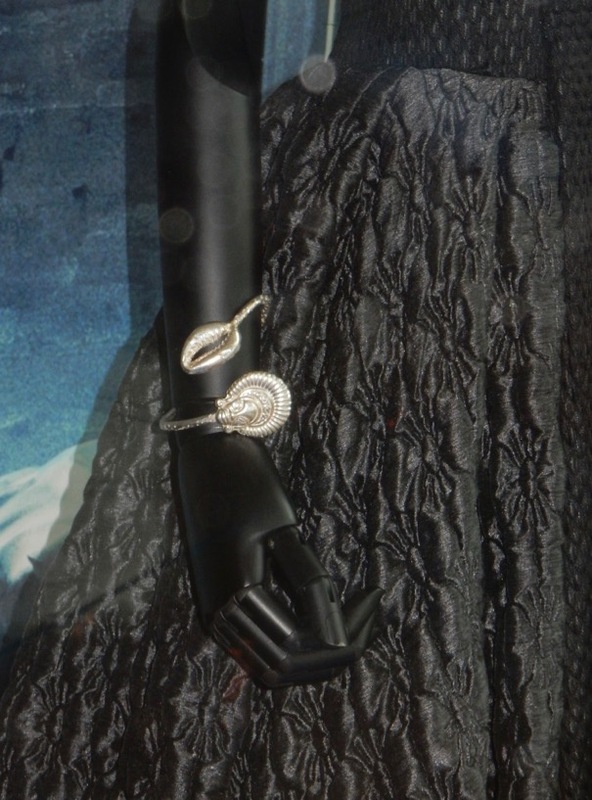 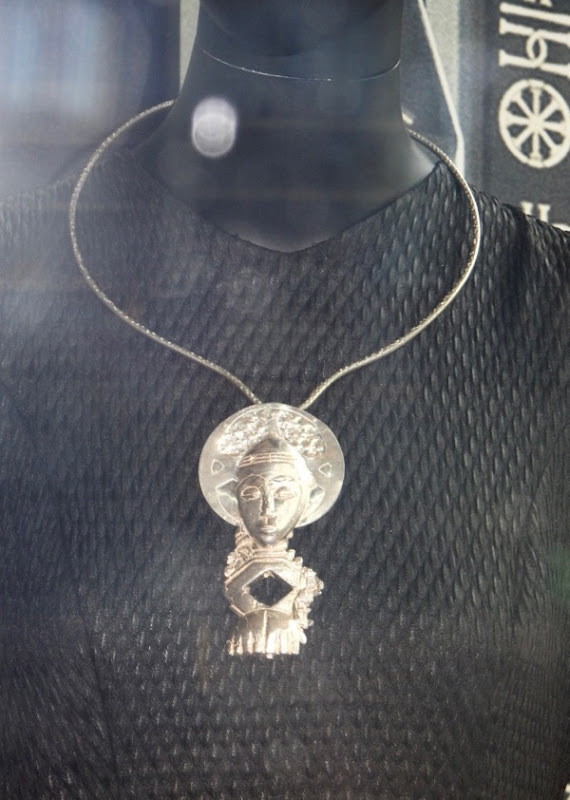 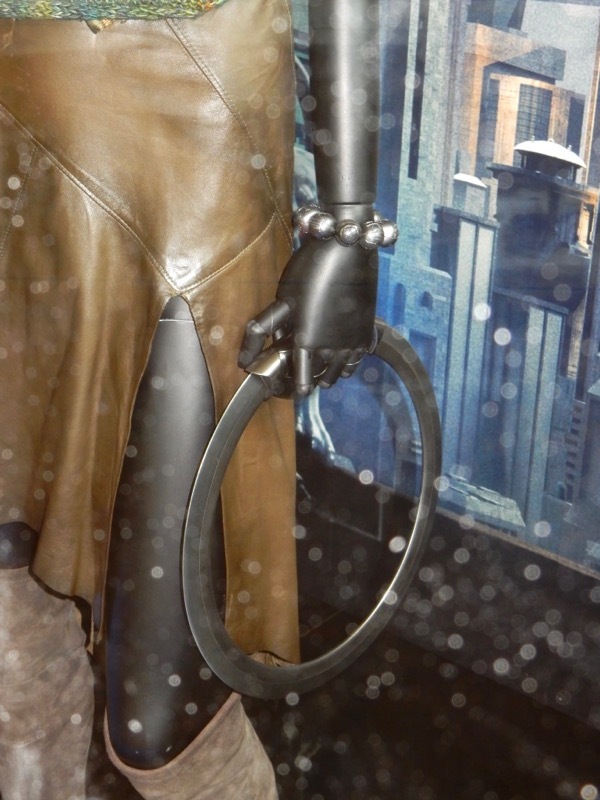 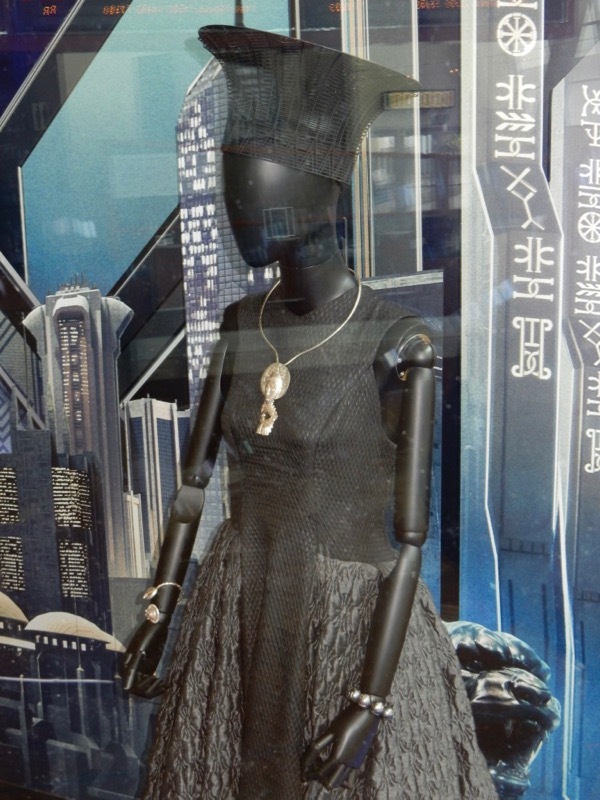 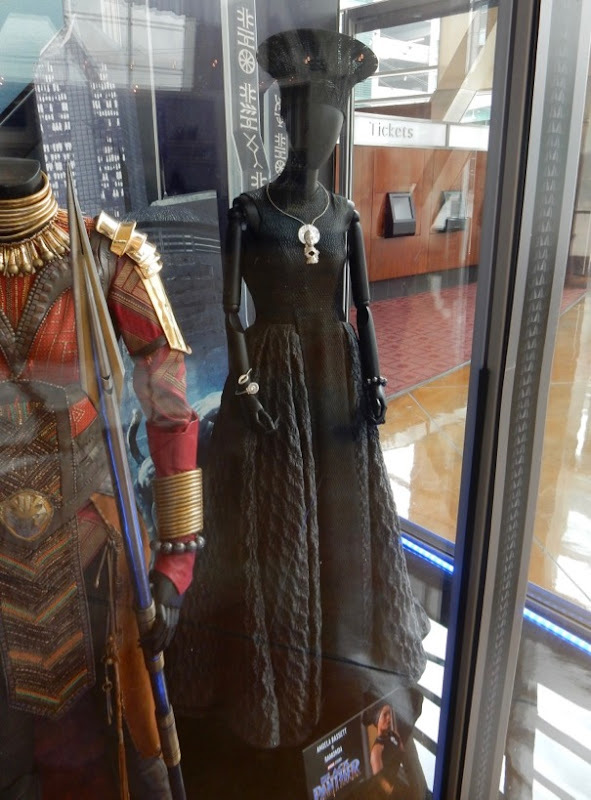 This exhibit also features her weapon of choice, a chakram ring-shaped blade (possibly made from Vibranium), and she wears a Wakandan Kimoyo bead bracelet, used for communication and more in the technologically advanced African nation. 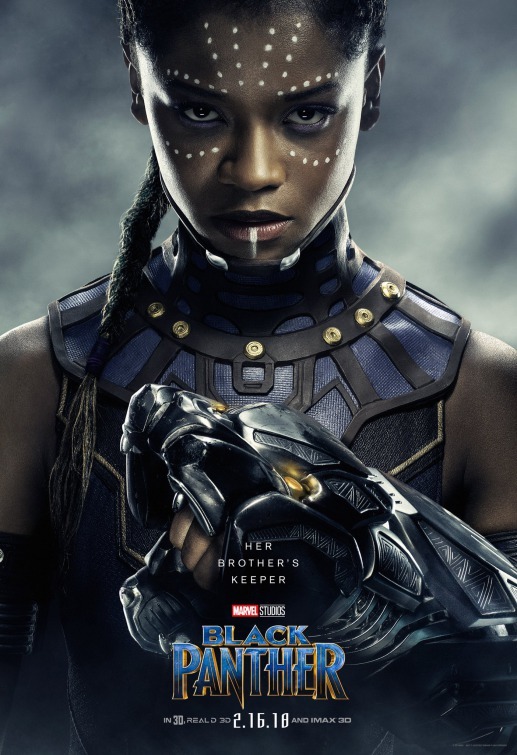 In this film version, Letitia Wright plays T'Challa's super-smart, younger 16-year-old sister and princess of Wakanda, Shuri. 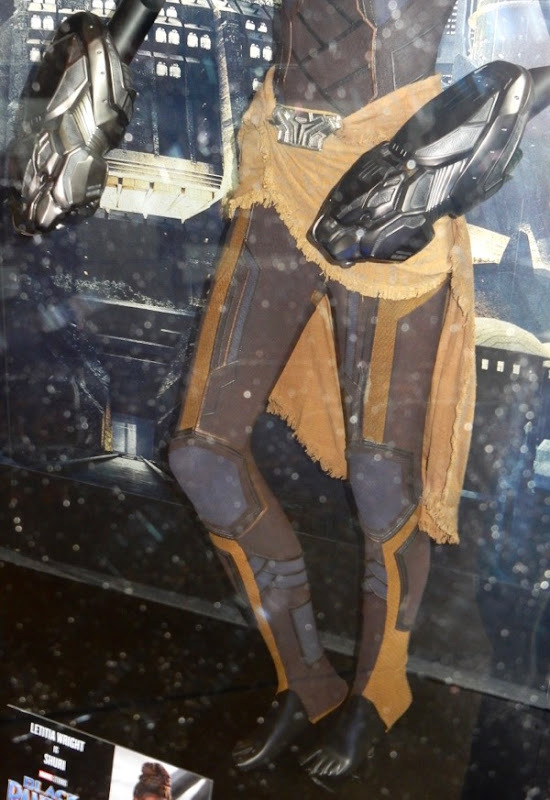 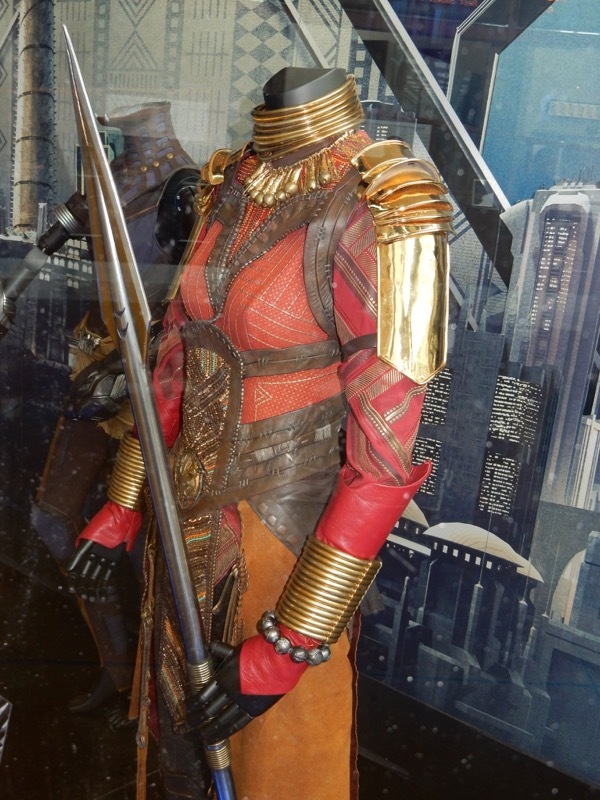 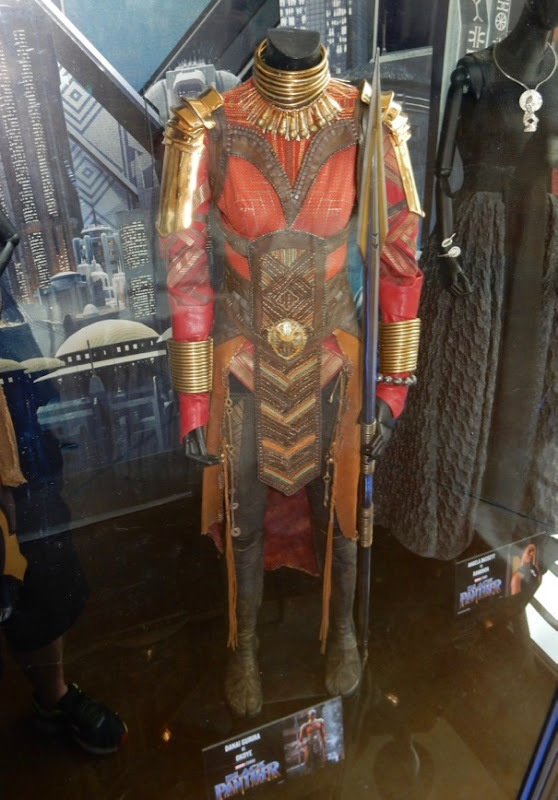 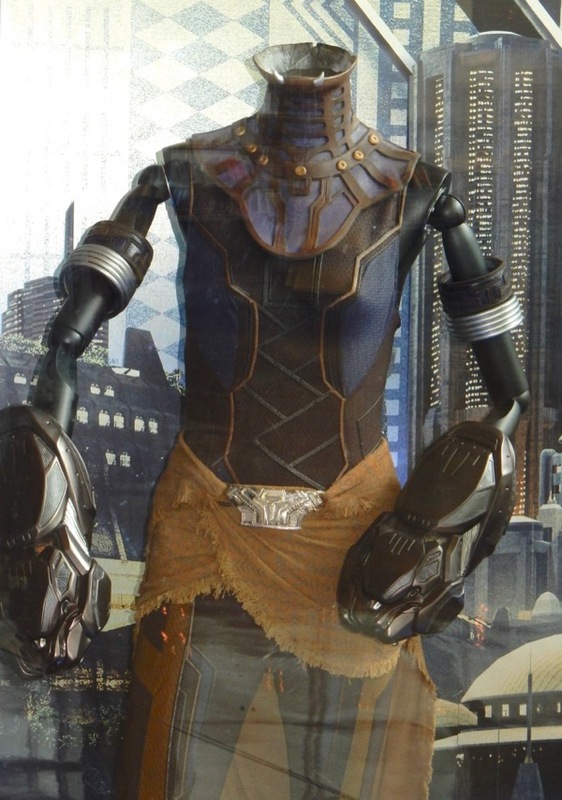 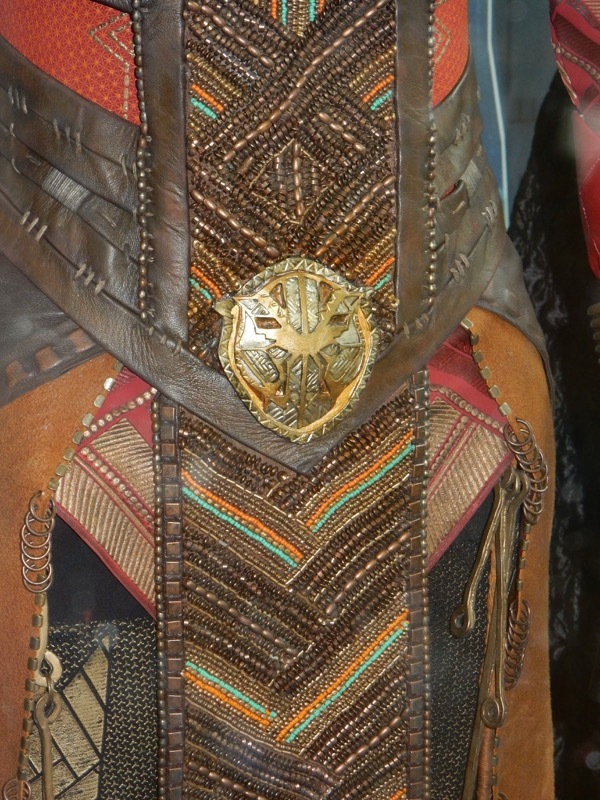 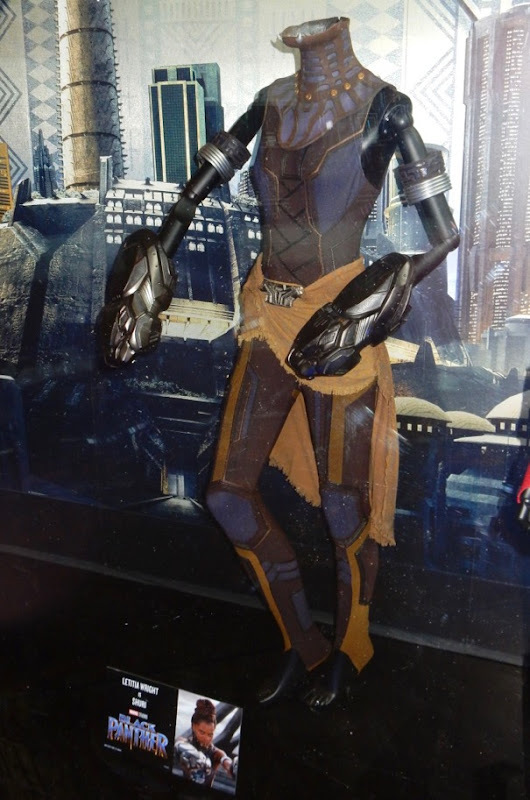 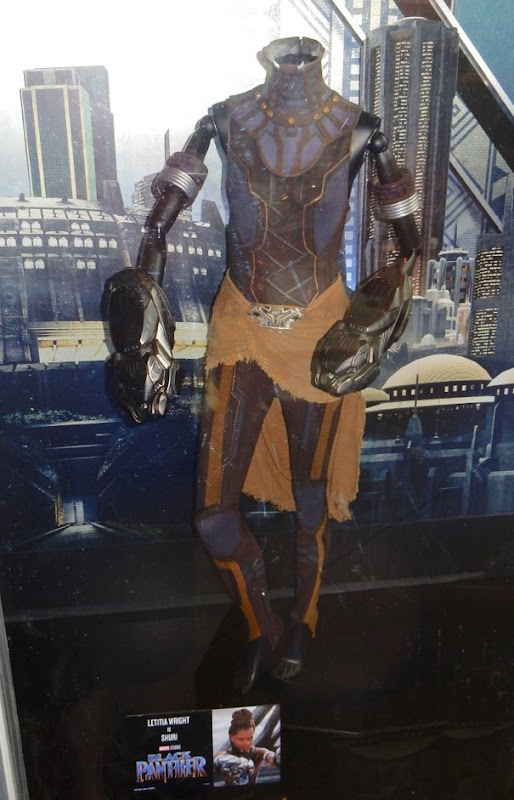 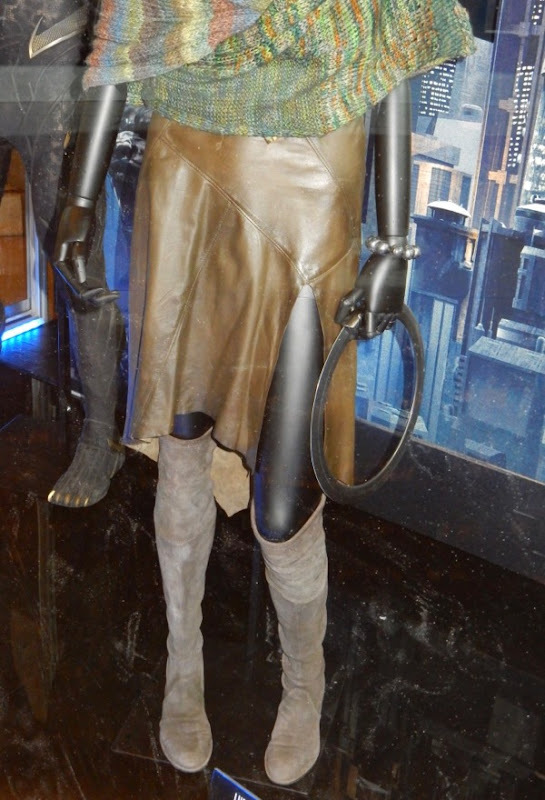 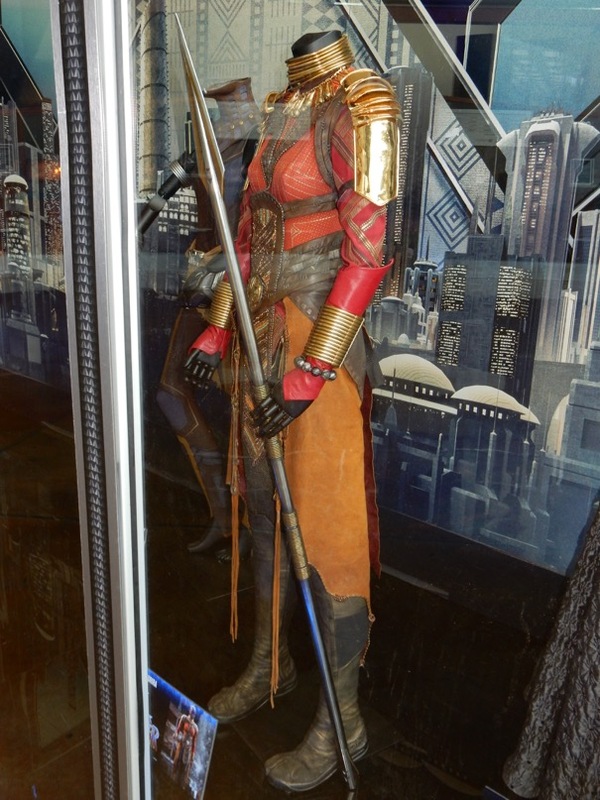 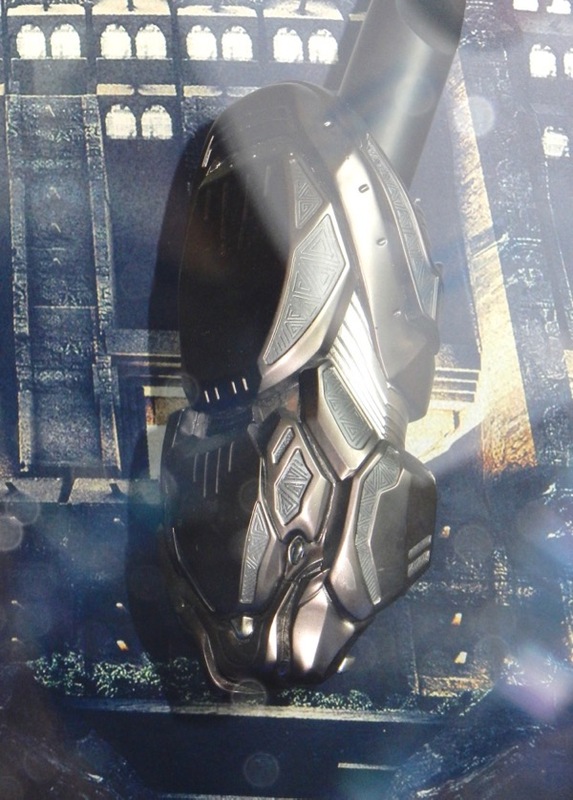 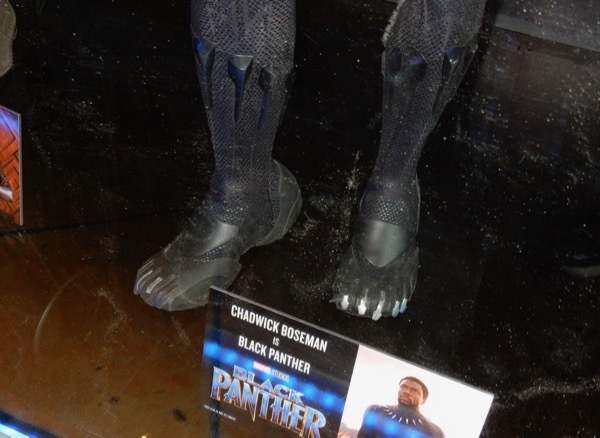 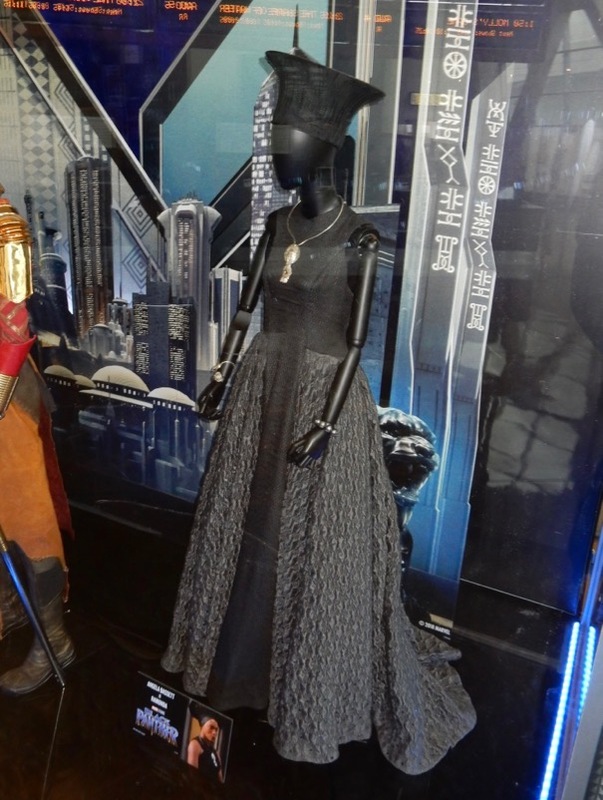 For a closer look as Shuri's costume and her amazing panther-themed gauntlets, plus Forest Whitaker's 'Zuri' costume and Winston Duke's 'M'Baku' costume, take a look at these Black Panther movie costumes on display out of reflective cases at Disney's D23 Expo 2017 last July. 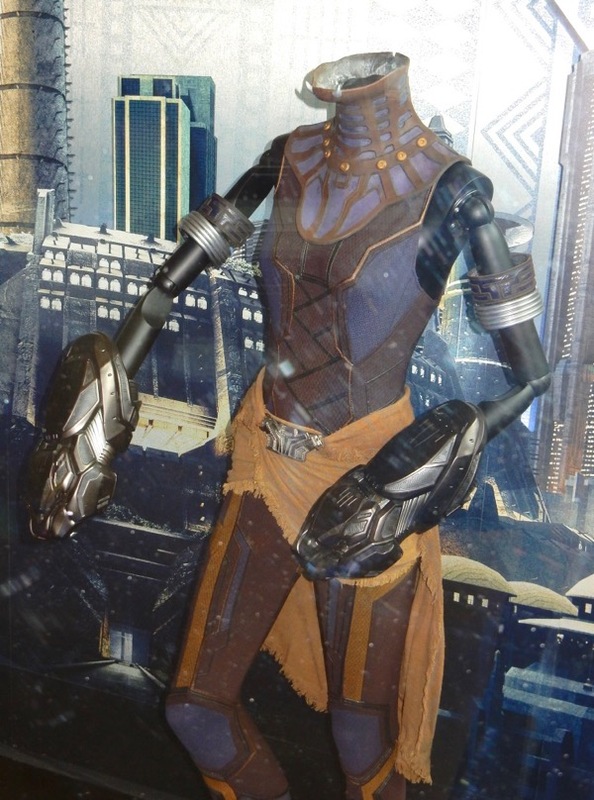 In the Black Panther's first solo movie, The Walking Dead's Danai Gurira plays 'Okoye', head of the Wakandan royal bodyguards and female security force, the Dora Milaje. 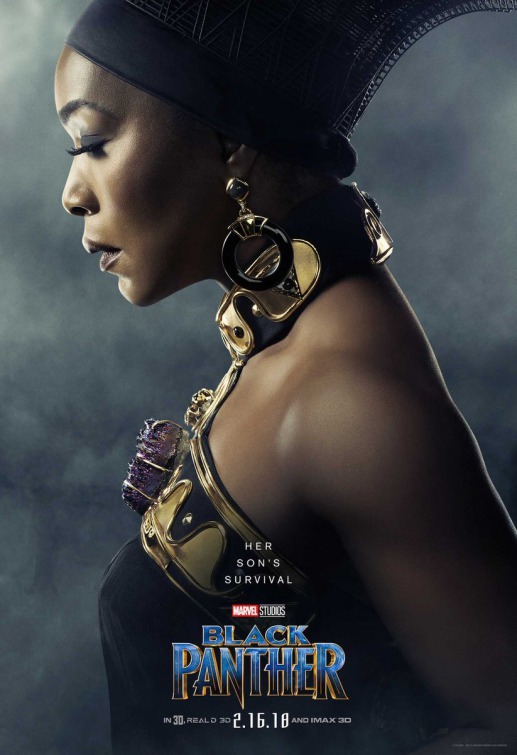 Angela Bassett plays 'Ramonda', 'T'Challa's' mother and Wakanda's Queen Mother and oft times advisor to the king of the isolated and technologically advanced African nation. 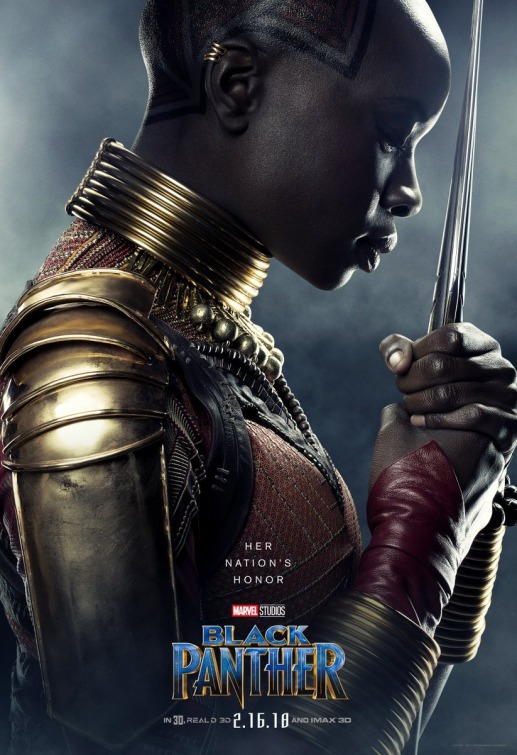 As fierce and loyal head of the country's secret service, in the movie Okoye feels remorse for failing to stop the assassination of 'T'Chaka', the Black Panther's father, in Captain America: Civil War. 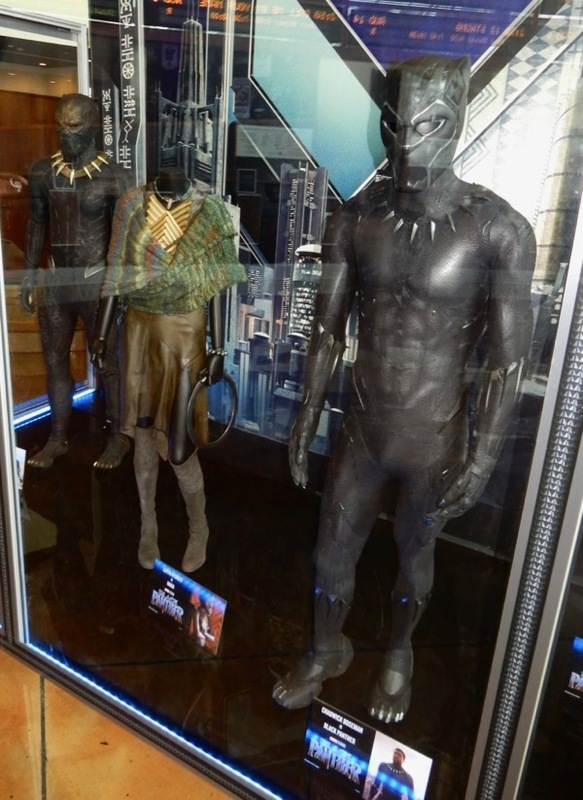 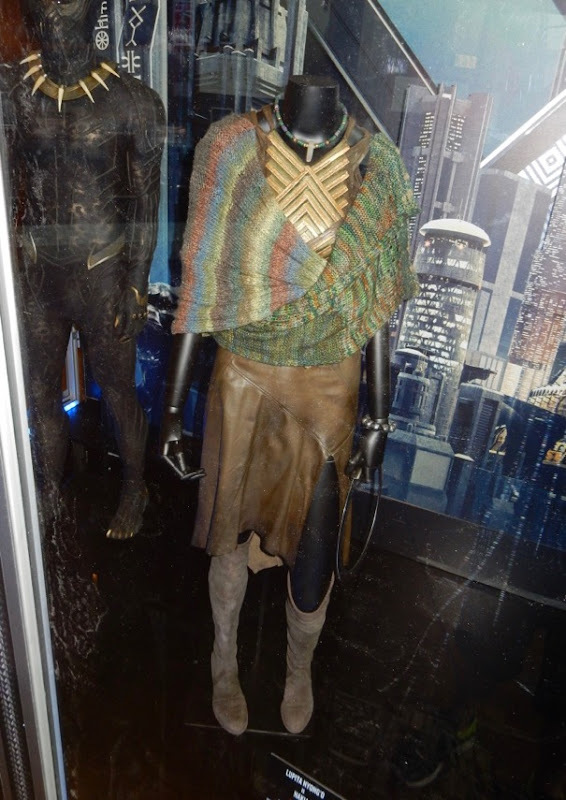 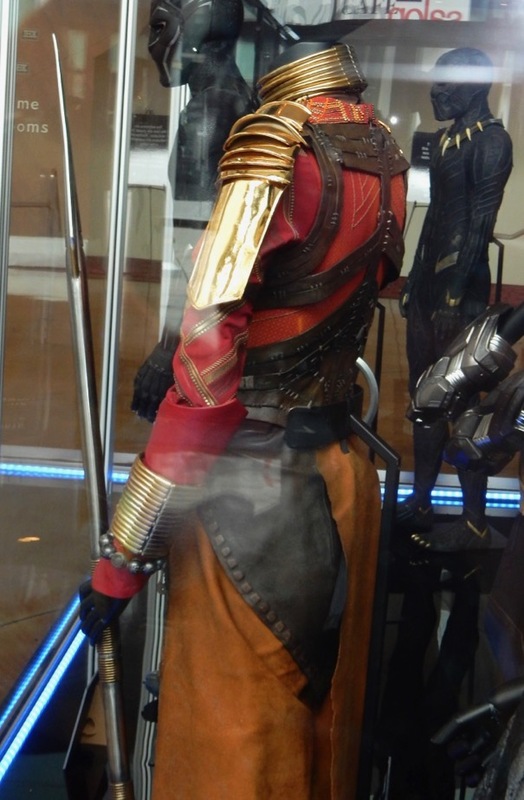 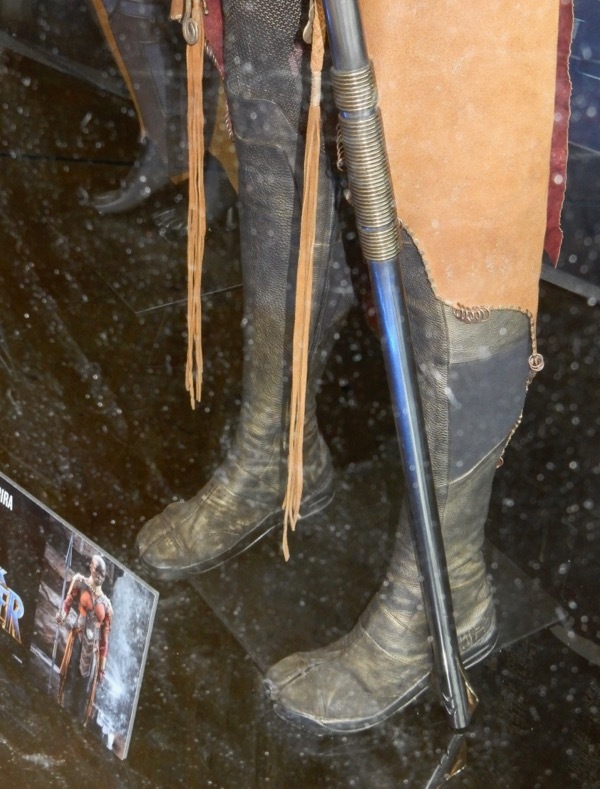 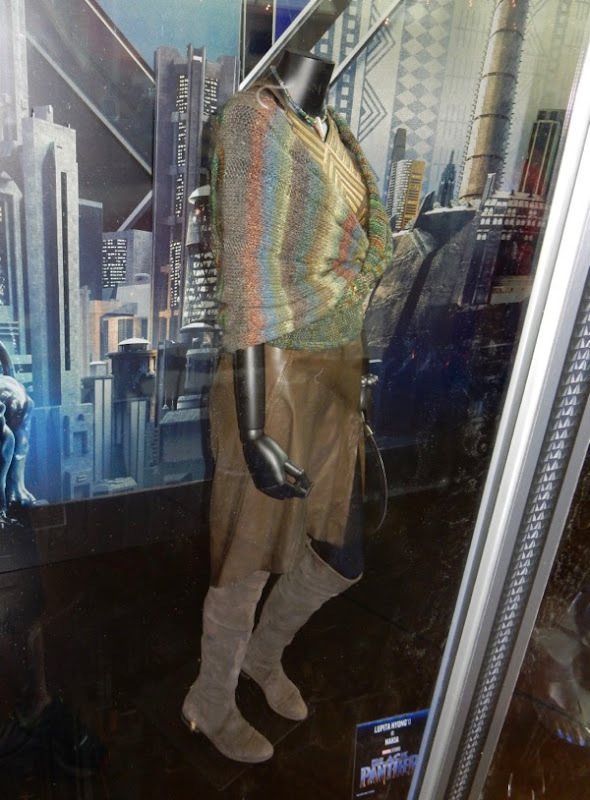 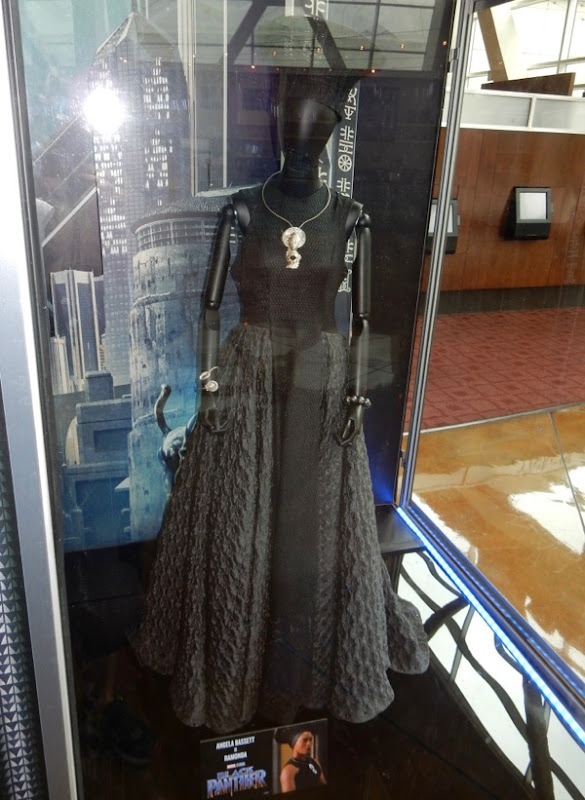 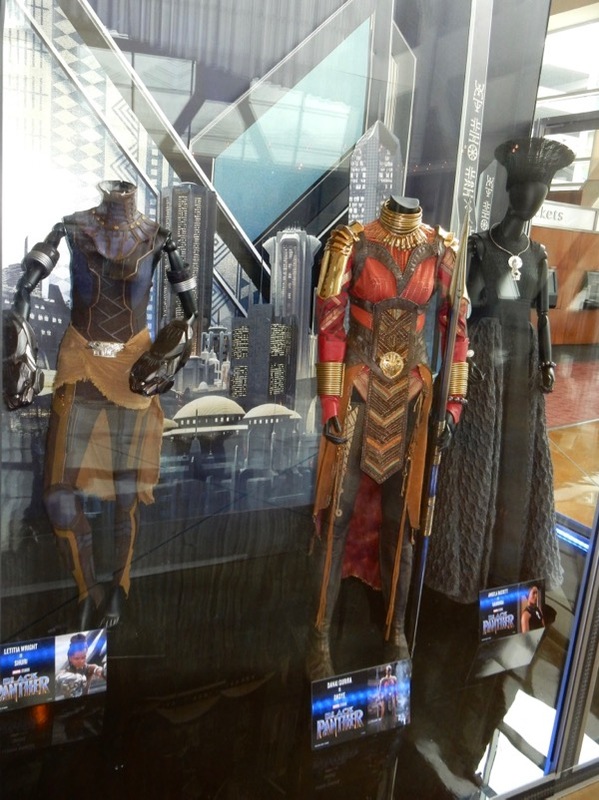 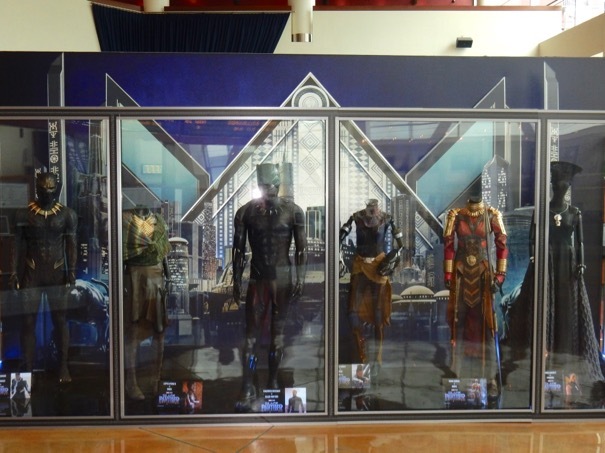 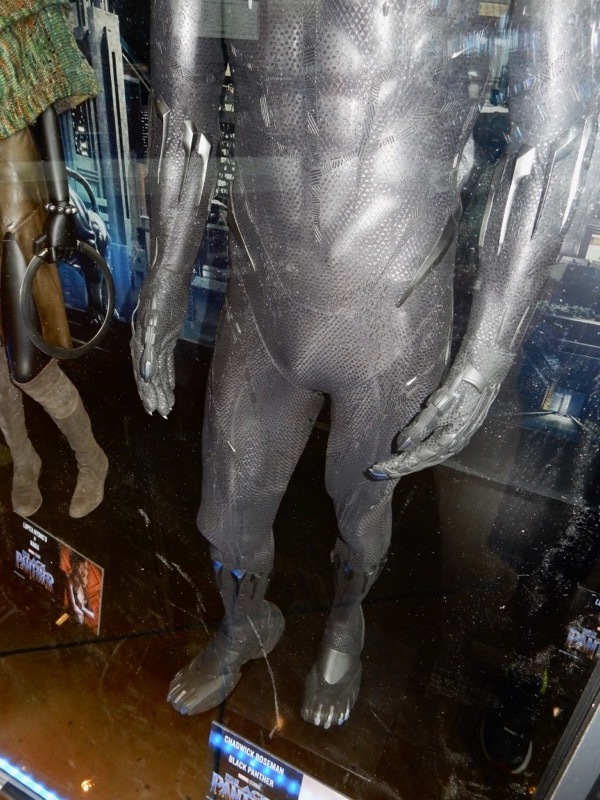 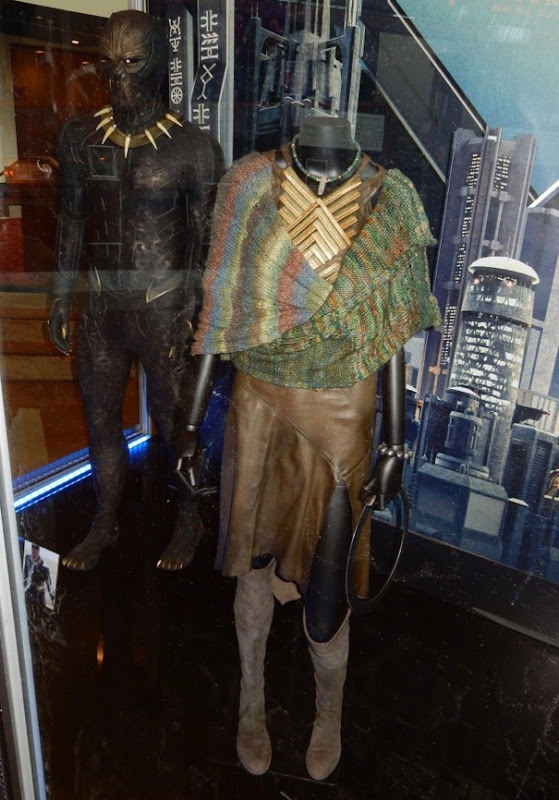 These costumes from Ryan Coogler's Marvel Studios movie were photographed on display at ArcLight Hollywood cinema on January 19, 2018. 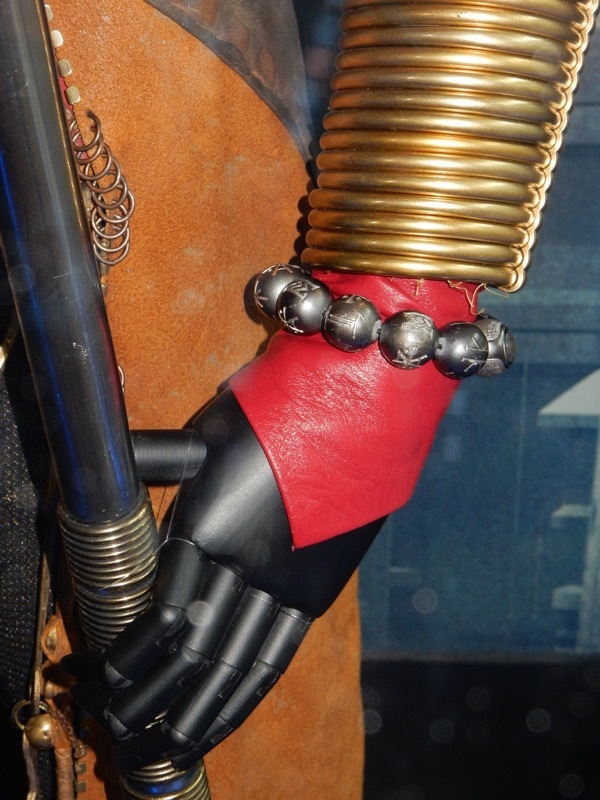 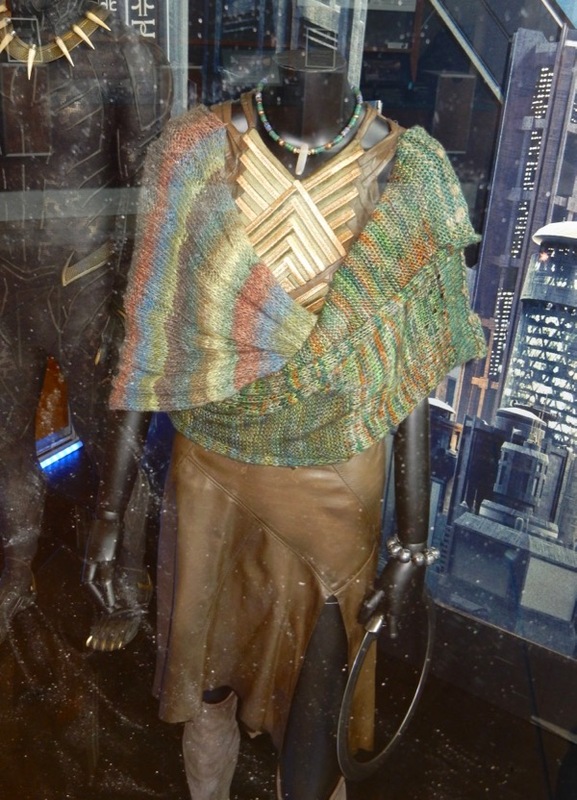 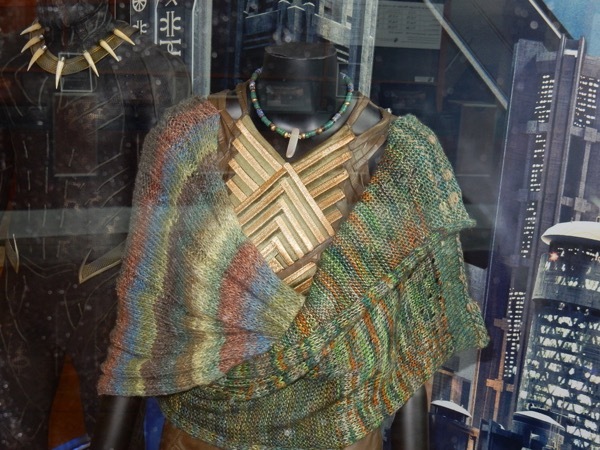 I'd previously seen some of these costumes out of display cases at Disney's D23 Expo 2017, but it was nice to get a look at Wakanda's Kimoyo bead bracelets included in this exhibit that all the citizens wear, that provide communications and other high-tech assistance. 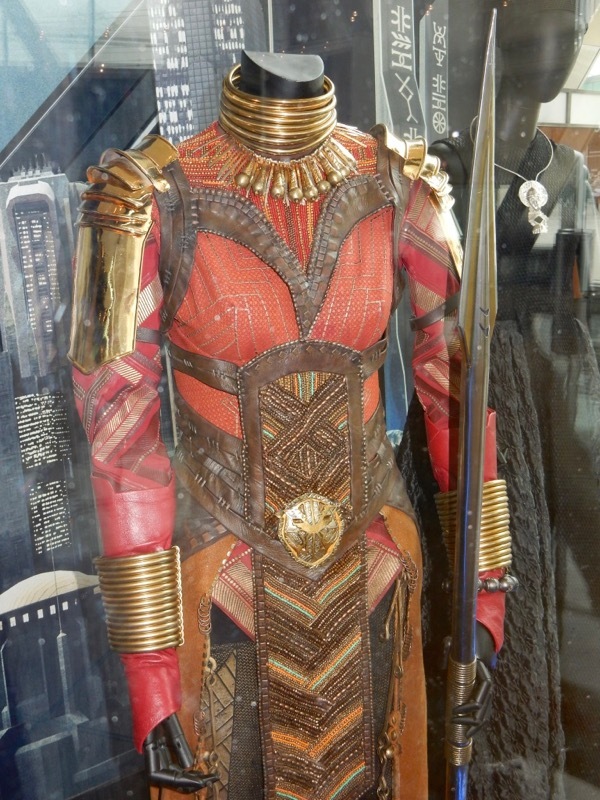 Angela Bassett's 'Ramonda' looks every bit the regal African royalty in this black costume. 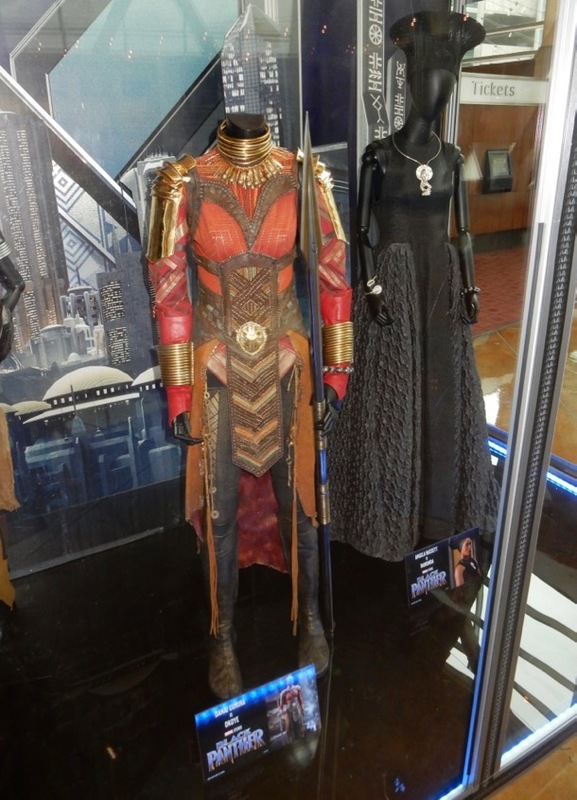 Ruth E. Carter was Costume Designer on Black Panther and responsible for infusing African tribal influences into the looks of the film's wardrobe. 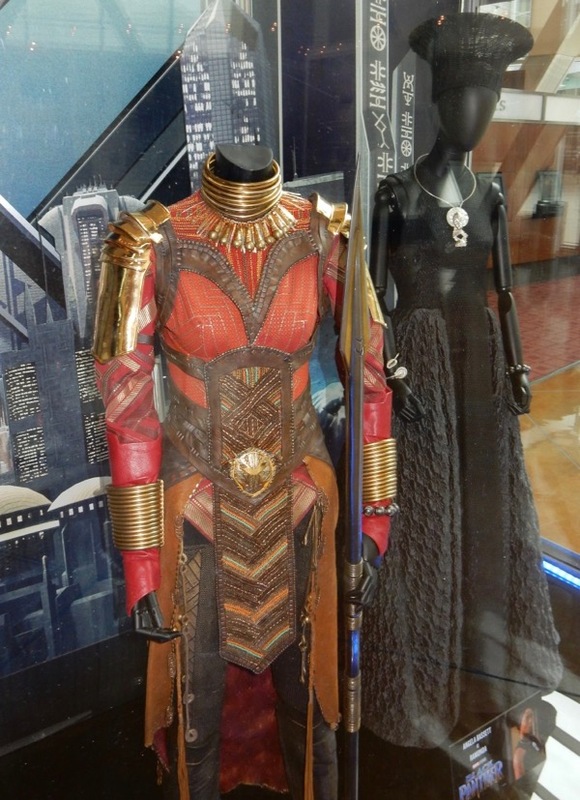 You can also see more of her design work in these Selma movie costumes and these Roots TV remake costumes, plus stay tuned for even more costumes from Marvel Studios latest superhero flick.